Many adults practice yoga not only for the ways that it benefits the body, but also for its well proven effectiveness in improving mental clarity and emotional balance, and now growing numbers of children are discovering that this type of exercise can be good for them, as well. 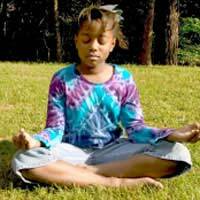 Some schools have begun to incorporate “yoga for kids” classes into their curriculum, recognizing the positive effects that yoga can have on students. The benefits of yoga are far-reaching, with participants in yoga classes for children experiencing all sorts of physical and emotional changes. Yoga is calming and is a wonderful stress reducer, which can be quite helpful for today’s generation of over-scheduled, high stress kids. Unlike a generation ago, modern kids are often kept busy with a number of organised activities, allowing them very little time to simply unwind and relax, but yoga helps them to do just that. While all kids can benefit from yoga, those with hyperactivity or anxiety conditions may be especially well suited to yoga classes. In addition to the emotional benefits of yoga, kids who enrol in yoga for children classes reap a number of physical rewards. Increased strength, flexibility, better balance, improved coordination, and heightened body confidence are common for those who practice yoga regularly, and with continued practice, many people notice an enhanced spiritual connection to the exercise. In order to pay attention and follow instruction, most kids should be pre-school aged before embarking on true yoga training, but many children younger than that enjoy pre-yoga or yoga related exercises. A number of DVDs are on the market today to introduce young children to the joys of yoga even before they are capable of mastering the traditional poses. Instruction in silly yoga, animal or alphabet yoga, and yoga poses designed to calm children and ready them for sleep are all available for at home use, encouraging parents and children to exercise together. As kids get older and are better able to take direction, parents may want to consider enrolling them in classes specifically labelled “yoga for children” or “yoga for kids.” Children are not simply small adults, so they need to have instructors who are educated in paediatric physiology and have the personality to offer patient, positive, and careful direction. When presented with options, many parents would choose to include yoga as part of the physical education programmes at their children’s schools. Some schools haven’t made changes to their curriculum in years (in some cases, it may even have been decades! ), but today’s forward-thinking educators are often enthusiastic about offering children a well-rounded educational experience. Interested parents may wish to contact their children’s teachers about incorporating yoga instruction into their kids’ school days. Yoga is an age old practice, but has enjoyed a resurgence of interest in recent years. Today’s busy lifestyles often require that people of all ages (kids included) actively seek healthy ways to relax and release stress. Yoga is an ideal choice for many, with benefits that are far reaching. Additionally, yoga teaches a respect for the body and spirit, encouraging participants to look at their overall health and lifestyle choices to see that they are making sound decisions regarding their nutrition, environment, and relationships. Such thoughtful introspection is an especially good habit to install in childhood, when many lifelong attitudes are being developed.